The remains of the gold mining town of Walhalla are situated in a steep narrow mountain valley in Gippsland, 48 km north of Moe and about 185 km east of Melbourne. In late 1862 alluvial gold was discovered here by a party of prospectors led by Ned Stringer. A rush to the creek, named after Stringer, quickly resulted. Quartz reefs were soon found and numbers of mining companies registered. The main reef, Cohen’s proved to be one of the richest in Australia. The Walhalla and the Long Tunnel were the two main mines initially. Walhalla is at the south of gold-bearing country extending from Jamieson, north of the dividing range. The track to Stringer’s Creek was from Toongabbie, 32 km to the south-east connecting with the larger towns of Rosedale and Sale near the Gippsland lakes. Machinery was brought in by packhorse until 1869, when improvements to the road allowed wheeled vehicles. A township was laid out in 1866 and was named Walhalla after the mining company, itself named for the place of Norse legend. By 1870, there were numerous stores, butchers, bakers, hotels, banks, post office, school, mechanics’ institute hall (1865), two breweries and a newspaper. The buildings were crowded along the narrow floor of the valley and perched precariously on the hillsides. In 1871, there were 1484 inhabitants. 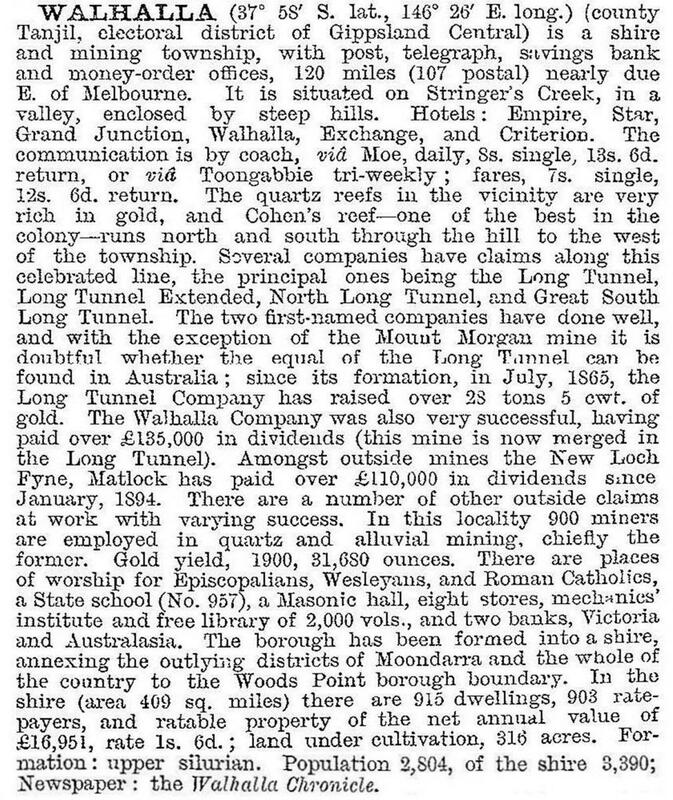 Routes to the south, to Moe and Traralgon, were opened and coach services began in 1878, but the town remained remote and isolated. A borough was proclaimed in 1872 and a shire in 1886. Walhalla’s heyday was from 1880 to 1895. 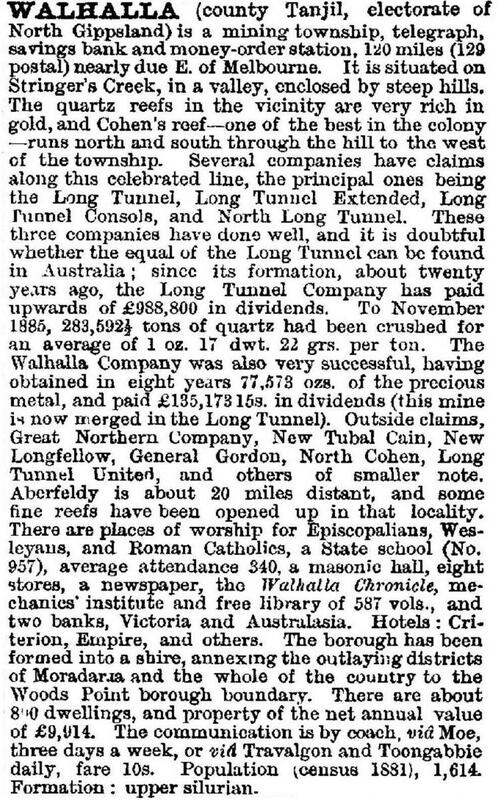 There were many mines along the reefs but the Long Tunnel, which took over the Walhalla Company, was the richest. The Long Tunnel Extended was another productive mine. The demand for timber for the mines denuded the hillsides, with timber tramways running for miles into the forest. Some sluicing took place on Stringer’s Creek from the mid-1880s. Fire was a constant hazard in the town. The worst fire, in 1888, destroyed some 30 buildings. In 1891, a destructive flood carried away buildings, bridges and waterwheels. There had been agitation for a railway to Walhalla for many years. It was 1910 before the line between Moe and Walhalla was opened. However, the mines had been experiencing difficulties since the turn of the century. The Long Tunnel Extended ceased working in 1911 and in 1913 the Long Tunnel also closed. In 1910, the population of the town was about 1600. There were still six hotels, six general stores and about 30 shops. Several smaller mining companies worked for a while but large numbers of people left the town. Many buildings were moved, such as the railway station to Hartwell, Melbourne. Others burned down or were abandoned. By 1915, there was only one hotel licensed and 17 shops in the town. In 1918, Walhalla shire became part of Narracan shire. Although, still a busy township, the population continued to decline. In the early 1900s, there was a tourist walking track from Walhalla to Warburton, but in the 1920s and 1930s large number of visitors arrived by car and motorcycle. Excursion trains to Walhalla were a popular activity, but the train ceased travelling as far as Walhalla in 1944. However, the Walhalla Improvement League (later Walhalla Heritage and Development League) was formed the next year, to preserve the remaining buildings and improve facilities for tourists. Fires and floods have further reduced the number of buildings but those remaining have been restored and protected. Although the permanent population numbers less than 20, the town is now protected as a conservation area under the Register of the National Estate and as an Historic Park. The hills are forested again and the valley is peaceful. The post office, band rotunda, fire station, shops and houses have been restored and several buildings are heritage-listed. Some incorporate museums, showing the former life of the busy mining town. The Long Tunnel Extended mine runs underground tours. The last section of the railway line has been rebuilt and a tourist train runs from Thomson station to Walhalla. Walks can be taken to the cricket ground and cemetery or along the old timber tramway, all high above the valley floor. The Alpine Walking Track also begins at Walhalla. Agitation began in 2014 for Walhalla, Erica and Rawson to split from Baw Baw Shire and join Latrobe City.